The egg cosy is approximately 10cm tall and 8.5cm wide (un-stretched). 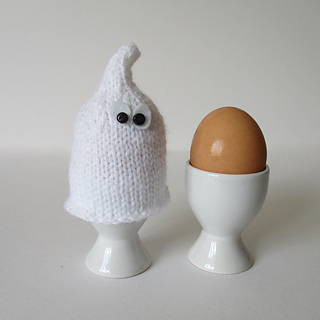 Have a spooky Halloween breakfast with a ghostly egg cosy! Simple to knit, you only need to know 3 stitches: knit, purl, and k2tog (knit two stitches together). It is a generous size to cover your egg. THE PATTERN INCLUDES: Row numbers for each step so you don’t lose your place, instructions for making the cosy, a list of abbreviations and explanation of some techniques, a materials list and recommended yarns. The pattern is 2 pages and written in English. TECHNIQUES: All pieces are knitted flat (back and forth) on a pair of straight knitting needles. I have no objection if you wish to make these cosies to sell to raise funds for charity. However please do not reproduce or sell this pattern.